What is the difference between migrant smuggling and human trafficking? As these distinct phenomena each get more media attention their definitions get more confused, with dangerous policy implications. 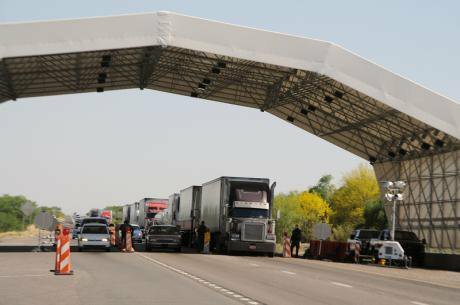 The US Border Patrol maintains permanent checkpoints to detect human smuggling. Eduardo Barraza/Demotix. All Rights Reserved. This year there has been a sharp increase of attention on the issue of migrant smuggling. The crisis of unaccompanied Central American youth at the southern U.S. border and the continued crisis of ‘boat people’ in the Mediterranean and off the coast of Australia have drawn attention to the increased use of human smugglers. Yet as attention to smuggling increases, both media and policy outlets are confusing the term smuggling with trafficking, resulting in dangerous policy implications. The United Nations defines migrant smuggling as the “procurement for financial or other material benefit of illegal entry of a person into a State of which that person is not a national or resident.” It is illegally moving people across border, usually at their request. Smuggling migrants is reportedly a $7 billion industry, with estimates that millions of individuals employed smugglers each year. On the other hand, human trafficking is characterized by exploiting another human being. The UN definition of human trafficking includes the recruiting, transporting, or harboring of people by means of threat, coercion, or fraud for the purpose of exploitation. That exploitation can come in many different forms, including sexual exploitation, forced slavery, slavery, servitude, or the removal of organs. The distinction between migrant smuggling and human trafficking is relatively new. In 1994 the International Organization for Migration defined human trafficking as including an illegal crossing of an international border, voluntary movement, and financial gain for the trafficker, which is nearly the modern definition of migrant smuggling. By the end of the 1990s however the definition appeared much more like the definition we see today. In 2003 the definition was cemented by the Protocol to Prevent, Suppress and Punish Trafficking in Persons. There are some important legal distinctions between human trafficking and migrant smuggling that are frequently overlooked. The most important and hard to distinguish is consent. Migrants consent to being smuggled and their relationship with the smuggler stops once they have reached their destination. As defined under the law, victims of human trafficking do not always consent to the end result of the transaction, even if at times they do, and even if they do originally agree to a new job, a new location, or to being smuggled. The initial consent becomes legally irrelevant to the crime once the trafficker has used threat, coercion, or fraud to exploit the victim. Also frequently confused is the concept of movement. Smugglers always move migrants across national borders. Human trafficking does not necessarily involve international movement. In fact, the UNODC estimates that approximately one quarter of human trafficking victims are exploited within their country of origin. Being conscious of the legal differences between human trafficking and migrant smuggling is important precisely because they overlap so much: any policies which affect one will affect the other. The legal distinction is even more important when you look at the rights and treatment of the victims of human trafficking. Migrant smuggling, depending on how it is executed, can be a victimless crime. In human trafficking there is always a victim. Thus confusing human trafficking with migrant smuggling could leave victims without necessary rehabilitation services and reparations. Fair or not, the majority of countries’ immigration laws treat undocumented immigrants very differently than human trafficking victims. Conversely, to conflate all migrant smuggling with human trafficking not only finds victims where there might not be any, but it also allows for unlawful or irregular migration to be rhetorically subsumed under a crime which everyone agrees should be eradicated. This is perhaps the major problem – confusion can allow politicians to dodge politically contentious issues and fail to protect migrants, by hiding behind a "combat trafficking" stance. None of the above is meant to diminish the suffering endured by migrants who are smuggled. According to the International Organization for Migration, 40,000 smuggled migrants have died since 2000. This itself points to the overarching danger of borders. And there is no doubt that the issue of consent versus coercion is gray and muddled. One instance of migrant smuggling could turn into human trafficking and back into migrant smuggling as situations and demands from smugglers change. But it’s important to understand that these are different types of crimes, and thus the policy approach to and consequences of them must be different. Human smuggling is a crime in as much as it constitutes an illegal border crossing. But it is not innately a crime against people or an abridgement of their human rights. This can never be said of human trafficking. To borrow terms from Anne T. Galleghar’s book, human trafficking can be understood as an “inherently exploitative” practice while migrant smuggling is “only incidentally exploitative.” As interrelated and young as these terms may be, this vital distinction requires that the crimes be treated distinctly. Failure to do so may result in a mischaracterized crime, or worse, a mischaracterized victim. This article was originally published on 12 November 2014. A revised version was published on 18 November 2014.